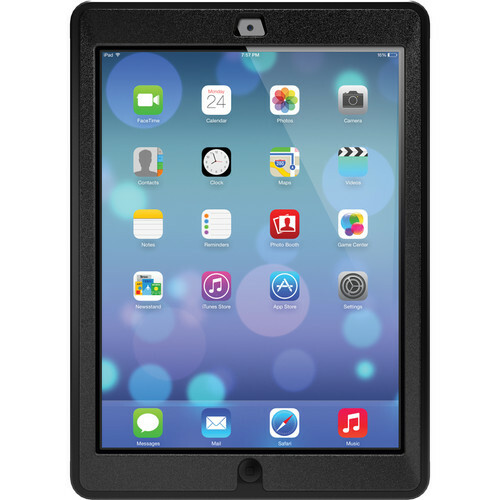 The black iPad Air Defender Series Case from Otterbox offers excellent protection for an iPad Air. The case features a two-piece polycarbonate inner shell which is surrounded by a synthetic rubber outer layer that protects your tablet against drops, bumps, dust and scratches. A screen protector is built into the inner shell to guard the delicate screen of your phone against scratches, scrapes and scuffs without minimizing the vibrancy of the display. Internal foam cushions the tablet and keeps it from moving around inside the case. The included shield stand offers added protection for the touchscreen during transport. It snaps onto the front or the back of case and includes an internal stand that supports landscape and portrait viewing and a comfortable typing angle. Box Dimensions (LxWxH) 10.5 x 7.5 x 1.0"
iPad Air Defender Series Case (Black) is rated 4.9 out of 5 by 9. Rated 4 out of 5 by SE from It just works If you are investing x amount of dollars into a ipad. It only makes sense to protect it. This case really makes it easy to travel without babying the ipad and with worrying over how other are handling it.It not only keeps your ipad air body safe, glass safe and dust free. It also has a built in kick stand that really saves you money from buying something else to prop it up. The only down side is that it's not easy to take your ipad air in and out of your case. (I don't know why you would want to, but you might). From my experience get it. Rated 5 out of 5 by K. Hill from Excellent Otterbox Product as usual! This Otterbox Defender case for iPad Air is great! You can just tell when you install your iPad inside of it that you are getting the best protection. The screen protector built into it does not interfere with use at all as you can barely even tell there is a screen protector. The case is really three pieces as you attach it to an included stand face down when not using it. The stand works great as well. I haven't dropped it yet, but feel this case would provide good protection if I were to drop it. Rated 5 out of 5 by Michael from Pricy but Worth it Had to get a case for my new iPad Air I got for Christmas. Started to look at the Apple Smart Case but the reviews mostly said it would stand on its own. So when I got a B&H email promoting this case and already having an Otter Box case for my iPhone 5s that I really like, I had to research it. It looked good and the built in stand in the cover was just what I was looking for. After finally getting my hands on it I started the assembly process. The protective case was a challenge installing to say the least. Trying to keep dust out while putting the case over my iPad was a trial in frustration. Once the case is on, it's a bear to get off. I had to put it on and off several times while using a lens blower and a lint free rag to make sure I had no dust under the cover. Once I got it all together the worst part was over. It fits like a glove and feels very purposeful. It really didn't add as much bulk as I would have expected. The outer rubber case really gives a feeling of secure protection. The best part is the removable cover. There's an ingenious built in stand that folds up to prop up your iPad in four different positions and down to install the cover. This definitely the best purchase decision I could have made. Very pleased with my Otter Box iPad cover. Rated 5 out of 5 by wcsheldon50131 from It's great I don't worry about a two year old now picking it up and dropping it. There is a cover that snaps over the screen if you need for travel in a bag. You need to remove the cover for the screen though if you are taking a photo with the iPad. That cover for the screen also can snap on the back of the iPad so you don't love it. This may be difficult of you have arthritis in the hands. Rated 5 out of 5 by Cpl Adams from Excellent, as expected from Otterbox The case is everything I expected. It is a great case all around. I have no doubt it will keep my iPad safe wherever I take it. Rated 5 out of 5 by Anonymous from Good! Keeps the iPad protected. We use these with the special needs students and have very few broken in these cases. Rated 5 out of 5 by Josecarlos from Exactly I was waiting. Now my iPad is protect. Really best price and excellent product. I recommend it. Rated 5 out of 5 by ernieo from A cool tablet to own I use it as a second workhorse different from the way I use my iPad. Why aren't the volume buttons in the right place and the hole to put finger print is blocked?? I'm not aware iPad had finger recognition software. The volume buttons seem to be located correctly in reference to my case.